This Sunday afternoon, May 1 at 3pm, come to the annual meeting of Friends of Princeton Open Space for succinct reports on this past year's achievements, followed by a talk by Bob Martin, Commissioner of the New Jersey Department of Environmental Protection. He will speak on “Green Acres: Preserving New Jersey’s Open Space for Future Generations.” More info on Commissioner Martin here. Afterwards, refreshments will be served, followed by a nature walk by yours truly to view spring blooms and a freshly restored dam and lake at Mountain Lakes Preserve. RSVPs are always appreciated at 609-921-2772. The meeting will take place at Mountain Lakes House, located down the long driveway at 57 Mountain Ave., Princeton. For 10am Sunday garlic mustard pull, see previous post. For jazz lovers, my Sustainable Jazz Trio will be performing at Communiversity this Saturday, April 30, at 3:15 at the intersection of Chambers and Nassau St. We'll perform organically composed original jazz utilizing only local ingredients. Also, check out DR Greenway's native plant sale this Friday and Saturday. Come pull for the local ecosystems this Sunday at 10am at Mountain Lakes, where we'll have the annual garlic mustard pull. 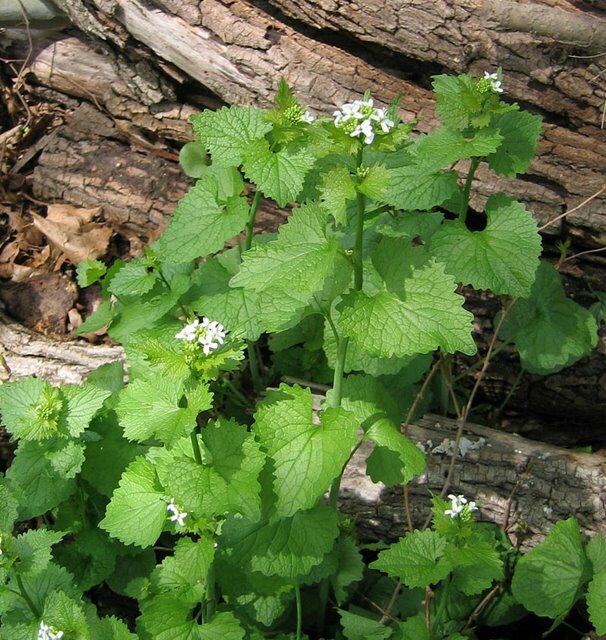 Garlic mustard is an edible but highly invasive weed in yards and natural areas that blooms this time of year. Because it displaces native plants and alters soil chemistry, we've been pulling it out each year around Mountain Lakes House before it can go to seed, and each year there is less. Workgloves and long pants are a good idea. Recent rains should make for easy pulling. Mountain Lakes House is at the end of the long driveway at 57 Mountain Ave in Princeton. 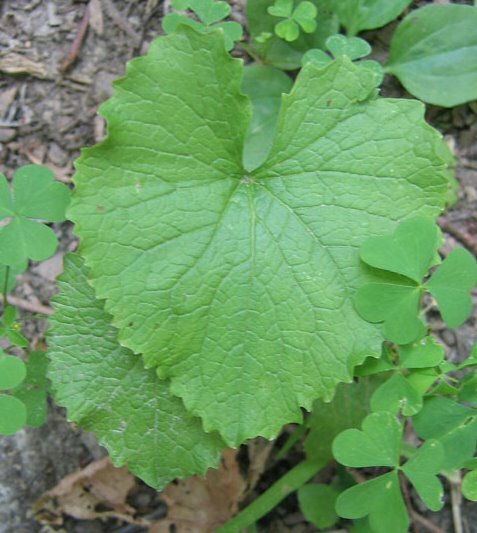 Here's a closeup of the leaf, in case you want to search for it in your own garden. The garlic smell of the leaves is distinctive. The other leaves sneaking a peek around the edges of this photo are wood sorrel and plantain. 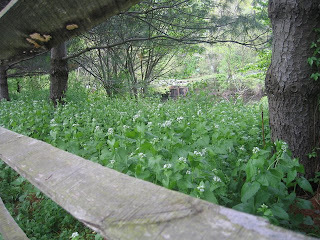 Garlic mustard can really take over, as has happened under the pines at Turning Basin Park, in this photo from some years back. This spring I couldn't take it anymore. The sparse, beaten down patch of grass and weeds along the extension, that is. With hostas coming up in the backyard, as they have year after year, in places where I'd rather have something more interesting and dynamic, I decided to finally dig them out and test their florid toughness on the street extension. In the process, I'd be relieved of mowing a piece of lawn that grew more dandelions than grass. I spaced the hostas every couple feet, and dug soil away from the edges of the curb and sidewalk. The edging accomplishes two things. It removes all the grass and weeds that might have grown up along the edge of the mulch, and also serves as a wall to keep the mulch from spilling out onto the street or sidewalk. Edging, along with the dirt displaced by the hostas, also provided several wheelbarrows worth of dirt that I could use elsewhere. It's always good to be thinking about where you need some extra dirt. A garden is like a miniature town, with a certain amount of excavating going on here, filling going on over there. Throw in a miniature farm (vegetable garden), a nature preserve (wildflower bed), a landfill (compost heap) for kitchen scraps, and a yard can have its own economy. These loads of dirt were headed for the intersection of my yard with the neighbor's driveway. The water runs off his driveway and would head straight for my house if I didn't make a berm that directs the water instead into a garden bed far from my foundation. While digging out the edges along the sidewalk, I noticed just how impervious is the soil in the extension, which explains why the grass was so ratty. You can see the thick red clay underlying sparse grass. Suddenly, the project took on a whole new civic and environmental dimension. All over town, the thin strips of grass between sidewalk and street likely have similarly poor, porosity-challenged soil that absorbs very little of the runoff from the sidewalk. Close-mown grass has very shallow roots that do little to improve the soils porosity. Changing to deep-rooted vegetation, such as these sacrificial hostas, combined with mulching to discourage weeds and provide cool, shady habitat for earthworms and other soil life, will over time change a bit of impervious ground into an absorber of rainwater, reducing by some small increment the flooding downstream. Here's the completed planting, with hostas hopefully positioned so that they won't grow out over the sidewalk. Ideally, a good rain would have followed to wash the dirt off the sidewalk, but a bit of sweeping finished the job. If all goes well and the plants don't get too big, the area will need little or no attention for the rest of the year. Update: One helpful step, not taken in this project, is to lay several thicknesses of newspaper or a single layer of overlapping cardboard down over the grass and weeds. This if primarily to prevent dandelions, curly dock and plantain from pushing up through the mulch. Unseen under a covering of woodchips or other mulch, the paper or cardboard decompose slowly, remaining intact long enough to exhaust the weeds of energy reserves. One of the easiest and most rewarding spring tasks is preparing a raingarden for a new season of growth. This raingarden was installed by Curtis Helm and me at Princeton borough's Senior Resource Center on Harrison Street. Water from the roofs is channeled into the garden, where it accumulates to several inches in the hollowed out area and then slowly seeps into the ground. Mosquitoes are not an issue because the water does not stand long enough for them to breed. A list of the plants, all adapted to wet soils, can be found in another post. All that was needed was a pair of pruning shears, gloves, and a plastic grocery bag that was conveniently found amongst all the paper and plastic trash caught by the raingarden over the winter. Though the spring cleaning of a raingarden is easy and rewarding, I nonetheless postponed it until the last minute. One more week and the new growth would have become tangled in last year's dead stalks. First step was to cut the brown stems of joepyeweed, green bulrush and other native perennials. one of which had lost its underlying stones and needed a little tightening of the joints. and gill-over-the-ground ( Glechoma hederacea, also called creeping charlie, or ground ivy) is a piece of cake if the soil is still soft after recent rains. Garlic mustard is a common weed that will spread by seed if not pulled out before it flowers. I've heard it makes good pesto, but have never tried it out. All that was left was to pick up the trash and toss the stalks back in the woods. No need to burden the borough crews with yardwaste that can easily decompose unnoticed back near a fenceline. Less than an hour and it was done. Now to figure out how to make a raingarden grow cake. The habit is to jump in the car, especially on a rainy evening, but the rain was letting up, we had just acquired a giant umbrella, the dog needed a walk, and my daughter only had to go five short blocks to get to the middle school choir concert. A bonus along the way was noticing that the clouds were moving in opposite directions, with low clouds, like dark gray wisps of steam, hurrying west, and higher clouds creeping east. Several websites say the phenomenon is a predictor of bad weather soon to arrive, possibly hail. The weather prediction is for rain and thunder. Mountain Lakes House is located at 57 Mountain Ave., Princeton. Refreshments will be served. Following the meeting, Steve Hiltner, Natural Resources Manager for Friends of Princeton Open Space, will lead a walk in Mountain Lakes Preserve and adjacent Tusculum. Anyone wishing to attend is urged to RSVP by April 27 -- phone 609-921-2772. Named to head the NJDEP by Governor Christie in January 2010, Bob Martin is an accomplished business and industry leader with recognized expertise in energy and utilities. He previously served for more than 25 years with Accenture LLP, the world’s largest business and technology consulting firm, retiring as a partner in 2008. He and his family have lived in Hopewell Township for more than 15 years. In a recent announcement marking the 50th anniversary of New Jersey’s Green Acres program, Commissioner Martin noted that in 1961, “The idea of using public money to purchase open space and setting it aside for public conservation and recreation in perpetuity was groundbreaking.” Since then, together with public and nonprofit partners, the Green Acres Program has directly protected 650,000 acres of open space and provided hundreds of outdoor recreational facilities in communities around the state. And voters in the nation’s most densely populated state have authorized $3.1 billion in Green Acres funding, approving all 13 bond referendums put before them. This spring, a new collaboration sprung up, as PHS horticulture teacher Paula Jakowlew offered Friends of Princeton Open Space some space in the high school's rooftop greenhouse to grow native wildflowers. The greenhouse, built as part of the high school's expansion some years back, has been keeping tropical plants happy over the winter, along with one as yet uncaptured treefrog that hitchhiked in on one of the plants. I brought in seed collected from remnant patches in the Princeton wild--species like cutleaf coneflower, bottlebrush grass, Helenium, rose mallow Hibiscus. We cleaned the seed, then set about planting flats. Here, trail builder, weed warrior and all around community volunteer Andrew Thornton demonstrates how to plant with pizazz. The result was a benchful of promise. Thanks to Paula, her son Shiloh, and the school for this collaboration! A showing of Bag It! at the Arts Council-- an entertaining and very informative documentary about the environmental consequences of the single use plastics that pervade our lives and often end up in open spaces, oceans, and animals' stomachs. Sustainable Princeton has begun an initiative to reduce plastic bag use in Princeton. A review I wrote of the film is here. A public meeting to learn more about the township's pilot program. Though more common out west, this will be New Jersey's first curbside collection of food waste. For those who can't find room in their backyards for a compost bin, this program is a way to reduce trash going to the landfill. at Princeton Day School, featuring a great list of speakers, lunch and a fair that Friends of Princeton Open Space will participate in. This conference is being organized by Liz Cutler, who is doing great work to promote sustainability at Princeton Day School and in town. The plants are all, or nearly all, grown from local genotypes. More info here.